The WINGs library has functions to directly draw an image in a label, button or slider. To write to other widgets, there is a function WMDrawPixmap (WMPixmap *pixmap, Drawable d, int x, int y). The pixmap can be written to any XLib variable of type Drawable, at position (x,y). This section shows how it is done to a window. The drawable is retrieved from the widget's view structure by the macro W_VIEW_DRAWABLE(WMView). You only call this macro after the widget has been WMRealizeWidgeted, or there simply will not be a drawable in it. To use it,#include <WINGs/WINGsP.h>. Try to comment out the line with the event handler function, and to call WMDrawPixmap(pixmap, W_VIEW_DRAWABLE(WMWidgetView(win)),30,30) directly from main. It won't work. When the WMScreenMainLoop starts up, there will be an Expose event. The window will react to the event by drawing itself, as specified in the WINGslib routines, but there won't be another call to WMDrawPixmap, unless you programme it yourself. The Xlib library itself offers more possibilities to draw in a widget, like drawing curves. The Xlib functions write to the drawable, like WMDrawPixmap. Xlib functions need the Xlib GC type graphics contexts. You keep different graphics contexts at a time to switch drawing styles. The WMColorGC macro creates one from a WMColor structure, which will give you the color you used as an argument. In the example, the line width in this graphics context is set to 3 instead of one with the function XSetLineAttributes. You'll get this line width whenever you use XMColorGC(screen->gray) from that point on. 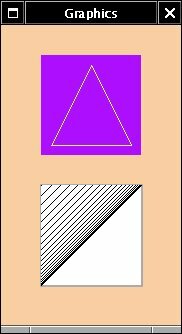 The next lines are drawn with default line width. The example is here. The XFree XLib man pages are here in 2010. 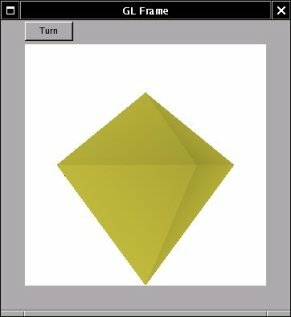 Just like the Xlib functions, we can use a drawable for drawing 3 dimensional images with the OpenGL/Mesa GL libraries. This section will show how to use a WINGs frame for this. The application shall have a GL-window and one button which allows the user to turn the object in the frame. To set up the variables needed to use the MesaGL library, we use the glX library. We shall also change some properties of the X-window win. We can retrieve the necessary information for both by way of an RContext, but what we need is so simple, that we shall use Xlib functions to get it directly. XCreateColormap(Display *display, Window win, Visual *visual, int alloc). int XChangeWindowAttributes(Display *display, Window win, unsigned long valuemask, XSetWindowAttributes *attributes). GLXContext glXCreateContext( Display *dpy, XVisualInfo *vis, GLXContext shareList, Bool direct ). Bool glXMakeCurrent( Display *display, GLXDrawable win, GLXContext ctx ). The frame's window Window win can now be used in the GL-call void glXSwapBuffers( Display *display, GLXDrawable win ). The source code is in the file glframe.c. You need to have MesaGL installed, and the glx library. To compile, use gcc -x c glframe.c -lXft -L/usr/X11/lib -L/usr/lib -lWINGs -lwraster -lOSMesa -lm -o glframe. If the compiler does not find the glx library, you could add -L/usr/X11/lib/modules/extensions -lglx, if that is where your library is.